This annual symposium at Blue Ridge Assembly in Black Mountain, NC featured lectures on botanicals, secretory IgA, Ayurvedic classification of western Herbs, reproductive health, therapies for fever, traditional root tonics, preparation of Echinacea in prevention of common cold, and more. 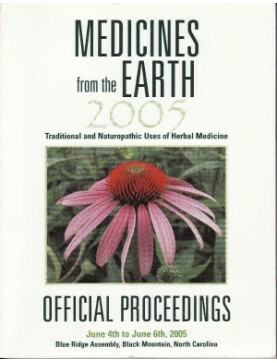 2005 Medicines from the Earth: Conference Book. Order download of PDF file on this page. ..
Speaker: John Douillard. Continued from Part 1. Discusses the patterns of imbalance that cause disea..
Speaker: John Douillard. Discusses the patterns of imbalance that cause disease and the Ayurvedic pa..
Keynote Session: Rosita Arvigo, Ryan Drum and Cascade Anderson Geller. Expect the unexpected in..
Speaker: Teresa Boardwine. Learn to prepare herbal tonics for many of the body's systems in sweet, s..
Speaker: John Douillard. Learn to prescribe herbs based on their dosha: vata, pitta and kapha. ..
Speaker: Rosita Arvigo. Presents the anatomical structures that support the uterus and the prin..
Speaker: John Douillard. Continued from Part 1. Ayurvedic massage treats the subtle body system and ..
Speaker: John Douillard. Ayurvedic massage treats the subtle body system and the physical to pave th..
Panelist: Chanchal Cabrera, John Douillard, DC and Donald Yance. As the medical community becom..
Speaker: Ryan Drum. The thyroid gland is particularly susceptible to unforeseen hazards includi..
Speaker: Randine Lewis. Addresses infertility and other reproductive disorders (including high ..
Speaker: Mark Blumenthal. This presentation reviews the research on the leading natural ingredi..